One of the hottest teams in college baseball still flying under the radar is UNC-Charlotte. The 49ers have been excelling all season long, and stand at 26-5 after a weekend sweep of St. Joseph�s. That sweep put UNC-C at 8-1 in the Atlantic 10, one game ahead of Richmond, Fordham, and Xavier for first in the conference. Their current seven-game win streak has gotten them into the top 25 in the NCBWA poll, and recognition in the USA Today/ESPN coaches� poll and the Rivals.com poll as well. Sure, the Hawks are only 4-23 on the season and last in the A-10 at 2-7, but what made the sweep impressive is that all three wins were shutouts. That gives the 49ers a 28.1 inning scoreless streak dating back to the last 1.1 innings of their 8-5 win over Winthrop on Tuesday. The school record is 35 innings, and it may well be hard to reach it, considering their next opponent is #2 North Carolina. The zeroes on the scoreboard have become a pretty routine for Loren Hibbs� team this season. The pitching staff has put together an outstanding season statistically. The 49er hurlers lead the nation in shutouts with nine, which is three more than Tulane and Virginia, who are tied for second. The team ERA of 2.35 is second only to Wichita State, who comes into the week at 2.25. 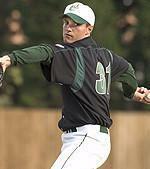 The leader of the Charlotte pitching staff is senior Adam Mills. Mills has put together arguably the most impressive collection of numbers in the country to date. He�s 8-1, with a 1.06 ERA, and 99 strikeouts. All three of those numbers put him in the top three nationally. He also leads the country in shutouts (three) and complete games. He�s been a part of five of Charlotte�s nine shutouts, and all three of his solo shutouts were complete-game, double-digit strikeout performances. Mills has steadily improved in his time in Charlotte, going from 4-3, 4.35 as a freshman reliever, to 6-4, 4.88 in his first year as a starter in 2005, to 8-5, 3.00 with 111 strikeouts last season. But he�s saved his best for his last campaign, putting himself among the nation�s elite hurlers with a fine senior season. It�s far from a one-man team though. Another senior, Spencer Steedley, is 5-0 with a 2.48 ERA. Steedley has thrown three complete games himself, and sophomore Zach Rosenbaum is 4-0 with a 2.65 ERA. Rosenbaum�s emergence has been a welcome one, considering junior Keith Moreland, who went 7-2 last season, is missing all of 2007 after Tommy John surgery. The 49ers aren�t starved for offense either, in the least. They�re one of a handful of teams in the nation with multiple .400+ hitters, in senior catcher Kris Rochelle (.438/3/29) and junior outfielder and St. Thomas, Ontario native Brad McElroy (.413/6/39). Senior second baseman Cory Lane isn�t too shabby either. Lane is hitting .351 with 13 doubles and 31 RBI, and has a team-leading 12 steals. He ranks second in the nation with seven triples, which gives him a career total of 26. As a whole, Charlotte is hitting .326 as a team and averaging over eight runs a game. And all of this is coming with Steedley, who was a preseason All-American after hitting .319 with 13 homers and 63 RBI in 2006, flourishing on the mound but struggling at the plate (.246/1/18). The 49ers are on track for their first bid to the NCAA tournament since 1998. They were a dominant team in the Metro Conference in its last few seasons of existence, winning the conference tournament in 1993 to earn their first regional berth in history, and then won two more regular season titles in 1994 and 1995. After moving to Conference USA, the 49ers didn�t fare so well for the most part. They did win 43 games and make the regionals in 1998, but were a lower-tier team in the conference for the better part of their membership. It looks like the move to the Atlantic 10 has paid off though. It may have been done with an intention to benefit other sports more, but it may well have helped the baseball program the most. In their first season in the A-10 in 2006, the 49ers went 35-20-1, and finished third in the conference with an 18-9 record. This season, with an extremely experienced club laden with juniors and seniors, the 49ers were picked as favorites to win the conference. And with that combination of experience and talent, they have given every opponent their best shot. Their five losses have all been close, with three of them coming by one run and the other two coming by two runs. Playing in the A-10 means that the schedule isn�t so tough, but that doesn�t mean anything, considering they�ve held their own against the quality non-conference opposition they�ve played. Along with their win last week over Winthrop, the 49ers won two of three against Southern Conference-leading College of Charleston, and narrowly lost to Wake Forest. The game against the Tar Heels will offer an opportunity for the 49ers to really showcase themselves. It would also boost their resume for a potential at-large bid. With an RPI currently in the mid 70s, Charlotte definitely has some moving to do to be in the right position for an at-large bid, if need be. If they keep winning and moving up in the polls, the RPI will increase and so will their presence nationally. However, winning the conference would take care of everything. Finishing first won�t be easy though, with four of their final six conference series being on the road. The final two weekends see the 49ers having to take trips to Cincinnati and Richmond to face their closest chasers. Last season, Charlotte was the favorite to win the conference as well, but lost six in a row after a 13-3 start in A-10 play to knock themselves back in the title race, and then went 0-2 in the A-10 tourney. But there appears to be no stopping them this time around, and if the 49ers do get into the postseason, they won�t be an easy out for sure. With one of the nation�s best arms in Mills, they can hang with anyone in that kind of setting. Steedley�s arm (and his bat, too) can�t be forgotten, and then there�s Rosenbaum, who�s emerging as a quality arm as well, and you�ve got a rotation that could really cause some trouble in June. Oh, and as mentioned before, they have more than enough at the plate to hold their own as well. So, if you don�t know about this bunch of 49ers yet, you better get to know them, before they go and knock your team off in the postseason. But, here�s thinking that the 49ers would be the last ones to call it an upset.